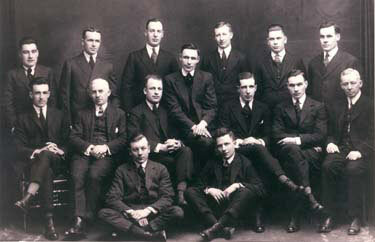 The Ottawa Senators were still flush with the Stanley Cup success of 1920 when they entered the 1920-21 season. The team won the first half of the schedule with a record of eight wins against two losses, permitting them a spot in the National Hockey League playoffs. But they faltered badly in the second half of the season, at one point losing seven straight games. The Senators finished third with six wins and eight losses. Cy Denneny finished second in overall scoring with 34 goals in the 24-game schedule, including a six-goal performance against the Hamilton Tigers on March 7, 1921. In the two-game, total goal NHL final, the Senators blanked the Toronto St. Pats in both games, 5-0 in the first contest (with Denneny contributing two) followed by a 2-0 win to take the series and earn a berth in the Stanley Cup final against the Pacific Coast Hockey Association champions, the Vancouver Millionaires. The Millionaires included Corb Denneny, Cy's younger brother. It was the first time that brothers would face each other in a Stanley Cup series. The series was a best-of-five, and was played in Vancouver. The Senators brought Sprague Cleghorn, who had spent most of the season as well as the playoffs with the Toronto St. Patricks, along as a roster player. Game One was played on March 21, with more than 11,000 fans shoe-horned into Vancouver's rink, the largest crowd ever to see a hockey game up to that time. They got their money's worth, as the hometown Millionaires dumped the Senators 3-1 in a game played using PCHA rules, which included playing with a seventh player called a rover. Three days later, the teams met again, this time using the six-man game employed by the NHL. Cy Denneny scored once in a 4-3 Ottawa win. Game Three was played on March 28 with western rules in effect. Denneny scored again in this contest, helping Ottawa to a 3-2 win and a two-game to one lead in the series. Vancouver rebounded in Game Four, an eastern rules contest that resulted in a 3-2 win for the Millionaires to even the best-of-five series at two games apiece. The fifth and deciding game was held on April 4, 1921. More than 2,000 fans were turned away from the arena that was already full beyond capacity. Vancouver took the lead with a first period goal that was matched early in the second by Ottawa's Jack Darragh. At 9:40 of that same period, Cy Denneny fed Darragh a pass that was put past Vancouver netminder Hugh Lehman for what turned out to be the winning goal. Darragh had, in fact, scored the Stanley Cup-winning goal the year before, too. 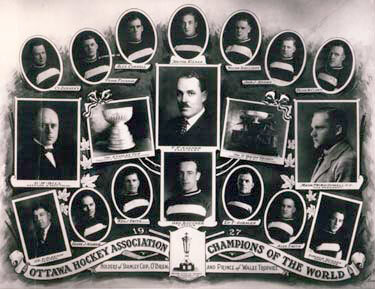 Eight members of that team went on to be elected to the Hockey Hall of Fame: Cy Denneny, Clint Benedict, George Boucher, Punch Broadbent, Sprague Cleghorn, Jack Darragh, Eddie Gerard and Frank Nighbor. For Cy Denneny, it was a particularly satisfying victory. It was the second consecutive championship for Cy and his Ottawa teammates. He scored twice and added two assists in the final to finish behind linemate Jack Darragh for the scoring lead in the Stanley Cup final. But it was also fun because Cy was able to claim bragging rights in the Denneny family as brother Corb was on the losing end of the series. Although he would savour five Stanley Cup championships, the victory in the spring of 1921 was the pinnacle of Cy Denneny's hockey career.